As Kansas sits in the grips of a blizzard that has schools and businesses closed, it's a great time to chill out with a little indoor snow play! You can have serious fun with snow and just a few basic supplies. Small bowls, paintbrushes, spoons, plastic dispensers, small toys, or whatever else you have on hand. Then you need snow! If you're like us, you have plenty of that. Topeka got six inches of snow yesterday, so most of us can track some down. 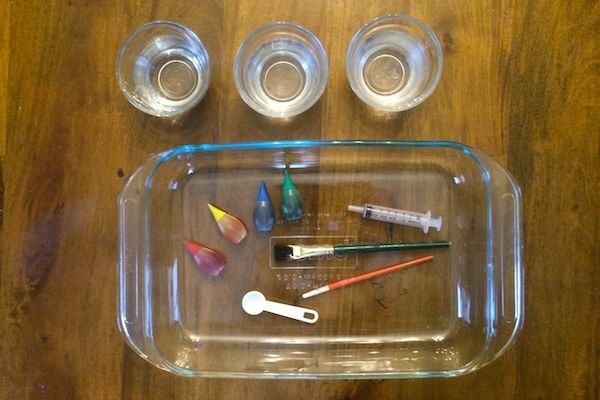 Mix liquid food coloring into small bowls of water to make paint. Watercolor paint works great, too! Mixing the colors is half the fun. 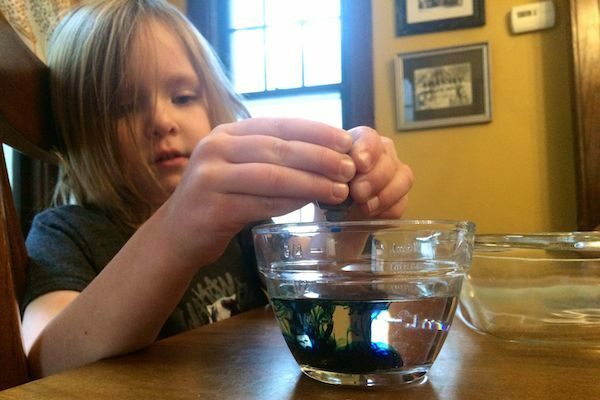 Let kids experiment with mixing and creating new colors. Then use whatever tools you have to create snow art! Drip, spray, brush or pour to make your snow colorful. 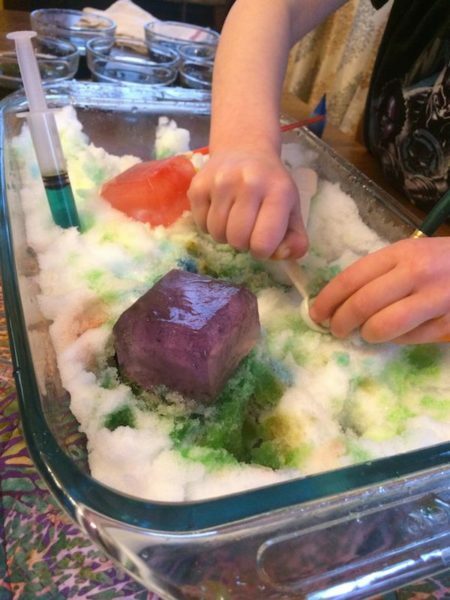 Mix in toys, colored ice cubes and other fun supplies. Get messy! 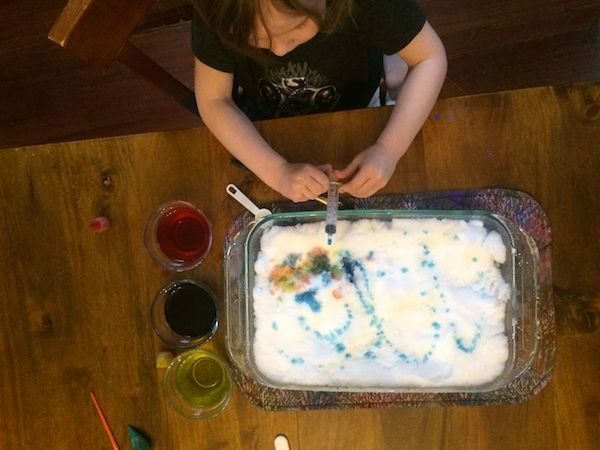 How do kids benefit from making snow art? They learn opposite words like warm and cold, smooth and rough, hard and soft, big and small. They imagine! Using symbolic thinking, the snow can become an animal habitat, a painting in museum, a frozen castle, or sky full of clouds. Older kids may get into the science they see at work! They see capillary action, or wicking, as colors spread through the ice crystals in the snow. 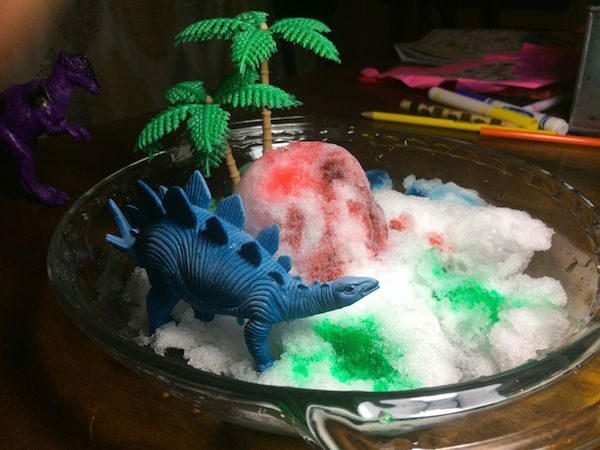 Kids may notice a drop of paint spreads to the surrounding snow, or that a hunk of snow placed in a bowl of colored water gradually becomes the color of the water. 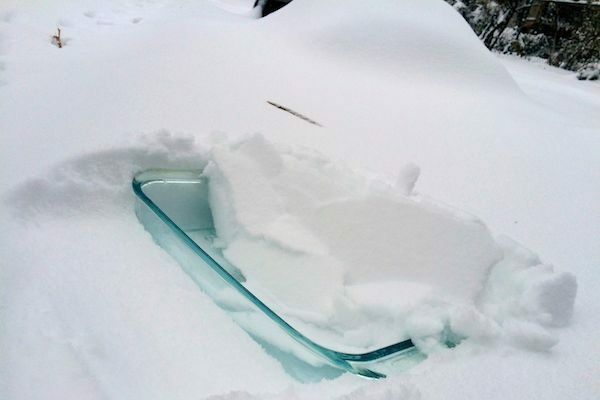 They're seeing liquid move through snow by filling in spaces between molecules. They see freezing and melting, and how that impacts absorption. An ice cube doesn't absorb color like snow does because snow has more space between molecules than ice to soak in water. They may like experimenting with different substances to see chemical reactions in their art. Try a sprinkle of salt! You'll have to agree that snow art is pretty cool! Once roads are safe, join us at the Kansas Children's Discovery Center for more serious fun.